The Great Northern Lofts building is located adjacent to the Farmer’s Market at 300 Wall Street n the historic Lower-town District of Saint Paul. Built in 1888, the former James J. Hill office building was converted in 2000 to the 53 unit residence. This unique property is truly a one-of-a-kind and is registered on the National Historic Register of historic buildings. This extremely well finished renovation still includes much of the original craftsmanship from the 1800’s. Many units have eleven foot tall vaulted ceilings and arched windows over looking the city, as well as, floor to ceiling fireplaces and modern finishes such as porcelain tiled bathrooms with step-up showers, glass cabinetry coupled with over-sized granite islands and massive living spaces that make a loft at Great Northern perfect for entertainment and daily living. There is a private courtyard in the back of the building and a remarkable entrance off of Kellogg Avenue. 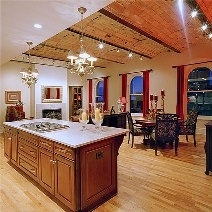 These are truly high-end lofts and were finished with the utmost care and attention to detail in their design.